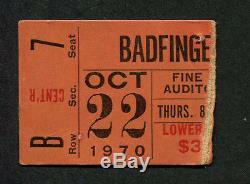 1970 Badfinger - concert ticket stub. October 22, 1970 - Fine Arts Auditorium, Texas Wesleyan College, Fort Worth, TX. Approximately 1 3/8 x 1 7/8 inches. Ticket has a pin hole. Our inventory consist mostly of one of a kind items that we do not have extras of, so when they are gone, they are gone! The item "1970 Badfinger concert ticket stub No Dice Tour Fort Worth TX Come And Get It" is in sale since Tuesday, August 04, 2015. This item is in the category "Entertainment Memorabilia\Music Memorabilia\Rock & Pop\Artists B\Other Rock & Pop Artists B". The seller is "novakent" and is located in Las Vegas, Nevada.